I've been thinking about you a lot and hoping you are doing ok. I just wanted to thank you again for sharing that trick of opening a new version of blogger (when it mangles your post), then publishing that version and xing out of the mangled version. It saved me again last night when an entire section of a post just completely disappeared. (Bless their pointed little blogspot heads over at Blogger.) The farm photos are looking great with the new camera. You should call them Dan's B'aaaahd Boys. Great picture! 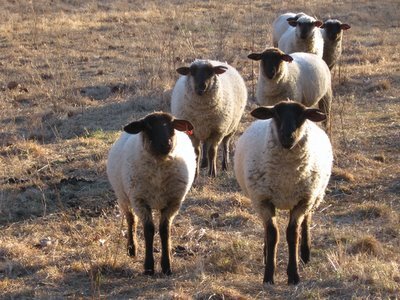 The sheep are so cute :-) Thanks for sharing . If you made a sweater from their wool, would it be golden too? Where IS the Doodlebug Dan? Miss D sends him a hee-haw!